I was a Memorial Day BBQ this past weekend there were a few sampler packs from Harpoon, Sarnac, and Samuel Adams in the cooler with a variety of beers to choose from. 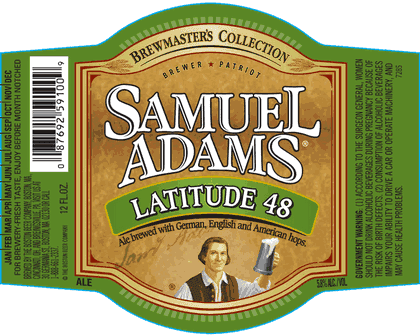 Besides trying Pale, Pale Ale from Sarnac, and a Golden Wheat from Harpoon, I tried a bottle of Latitude 48 and I was instantly amazed at how good this beer tasted. It reminded me of a cross between BBC's Cabin Fever Ale and Lost Sailor India Pale Ale. A perfect combination of that bitter ale aftertaste and hoppiness you get with the India Pale Ale. Hope this beer makes it out of the Brewmaster collection into it's own cardboard sixpack carrier sometime soon.